More than 200 scientists and academics from all over India have condemned the police crackdown at Hyderabad Central University on 22 March, and have called for the resignation of HCU vice chancellor Appa Rao Podile. In a letter to chancellor C Rangarajan on Monday, teachers and research scholars said: "A judicial enquiry has been initiated by the ministry of human resource development into the events around Vemula's suicide, and Appa Rao is one of the central figures in those events. There is a case against him under the SC/ST Atrocities Act and another under the laws abetting a suicide. In these circumstances, it is utterly inappropriate for him to occupy the office of the vice-chancellor.... We demand that he relinquish his office forthwith." Signatories to the letter include physicist Ashoke Sen from the Harish Chandra Research Institute, Allahabad; astrophysicist Naresh Dadich from the Inter-University Centre for Astronomy and Astrophysics, Pune; physicist Vikram Vyas from St Stephen's College, New Delhi; computational biologist Rahul Siddharthan from the Institute for Mathematical Sciences, Chennai; and computer scientist Kuntal Ghosh from the Indian Statistical Institute, Calcutta, according to The Telegraph. 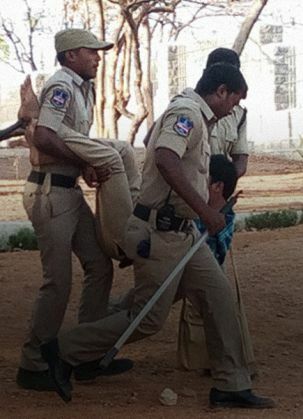 Students at HCU spent 48 hours without food, water and electricity, and faced massive police brutality on 23 and 24 March, after some students protesting against the return of the vice chancellor from leave vandalised his residence on 22 March. The students allege that Appa Rao contributed to the suicide of Dalit scholar Rohith Vemula on 17 January. In their letter to the chancellor, the signatories said that there has been "almost no progress" in the police case against Podile, whereas the police acted quickly against the students. "We demand that this imbalance be redressed and that the cases against Appa Rao be speedily brought to their logical conclusion," said the letter. On Monday, the JNU students' union and a students' group marched to the National Human Rights Commission office in Delhi, accusing HCU of "atrocities against students". Teachers associations at Delhi University, JNU and Jamia Millia Islamia have condemned the police crackdown on HCU.